Get Real Health’s products and services have earned a diverse array of awards around the globe for the company and its clients. Get Real Health has been selected as the winner of the “Flip the Patient” Challenge by the Personal Connected Health Alliance (PCHAlliance), a HIMSS organization, and WEGO Health (a PCHAlliance member organization), which is the world’s largest network of patient leaders. Get Real Health receives a monetary award of $5,000, which will be used for consulting services provided by patient subject matter experts who are active in WEGO Health’s patient leader community. World Trade Center Institute Awards’ Selection Committee has named Get Real Health as a winner of its 22nd Annual Maryland International Leadership Award. WTCI chose Get Real Health and six other firms for the award from among 150,000 Maryland companies. The International Business Leadership Awards celebrate vision, international success, and excellence in leadership for Maryland firms. 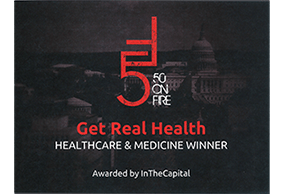 DC Inno’s 50 on Fire DC — an awards program that brings together the “disruptors, luminaries and visionaries” who are pushing Washington, D.C., forward and promoting change — honored Get Real Health in the Healthcare and Medicine category for 2016. The 2016 Health Service Journal (HSJ) awards named Get Real Health’s client, University Hospital Southampton NHS Foundation Trust, the “Using Technology to Improve Efficiency” winner for it’s InstantPHR-powered My medical record. The EHI 2016 Awards named Get Real Health’s client, University Hospital Southampton NHS Foundation Trust, the “Best Use of IT to Support Clinical Treatment and Care” for it’s InstantPHR-powered My medical record. The 2014 EHI Awards highly commended South London & Maudsley NHS Foundation Trust’s MyHealthLocker in the “Best use of technology to share information with patients and carers” category. The mental health application is powered by InstantPHR®. Healthcare Informatics named Get Real Health a Top 6 Up-and-Coming Healthcare IT Company. 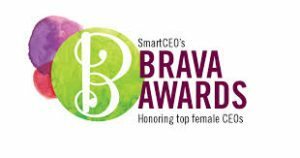 SmartCEO’s Brava! Awards recognized Get Real Health President & Founding Partner Robin Wiener as a top female executive in 2014. InTheCapital recognized Get Real Health as one of the “hottest” companies in the Washington, D.C., region. The Washington Business Journal named Get Real Health one of the Best Places to Work in Greater Washington. The Health 2.0 Developer Challenge sponsored by the ONC named Get Real Health Blue Button Mash Up Challenge Third Place Winner for InstantPHR’s integration with Blue Button. The 2012 Computerworld Honors Program recognized Get Real Health and its client MedStar Health as a Laureate for MedStar Health’s eHealth2go, a diabetes management application powered by InstantPHR. 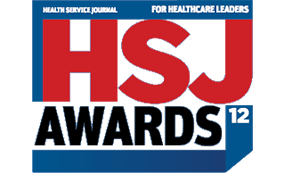 The Health Service Journal’s 2012 HSJ Awards named Get Real Health’s client, South London and Maudsley NHS Foundation Trust, “Highly Commended” for its InstantPHR-powered solution, MyHealthLocker. Get Real Health’s client Sanofi Canada received the Digital Innovation Award at the Pharma Digital Awards ceremony, hosted by eyeforpharma. Get Real Health developed the company’s diabetes management application, STARsystem by Sanofi Canada. Get Real Health’s client, MedStar Health, received a 2011 Microsoft Health Users Group Innovation Award for its InstantPHR-powered solution, eHealth2go. The Maryland Incubator Company of the Year Awards named Get Real Health (formerly Get Real Consulting) the Graduate Company of the Year. The Microsoft Health Users Group 2009 Innovations Awards named Get Real Health’s client, the American Heart Association, winner in the Best Use of Microsoft HealthVault Applications category for its Heart360™ application developed by Get Real Health. The Microsoft Health Users Group 2010 Innovations Awards declared Get Real Health’s client, Premera Blue Cross, winner in the Best Use of Microsoft HealthVault Applications category for its Vivacity Spending Scout™ application developed by Get Real Health.